At the death of Countess Matilda (1115) the Florentine populace to all effects already constituted a Commune. The numerous privileges conceded by the "gran contessa" and the events in which the Florentine community had played a leading role in the struggle against the emperor, induced the people to organize autonomously and to undertake action aimed at weakening imperial power. It was therefore inevitable that in 1125, upon the death of the last emperor of the Franconian dynasty, Henry V, the Florentines decided to attack and destroy Fiesole, the neighboring rival city. As a result the two counties were conclusively united and remained as separate entities only on an ecclesiastic level with Fiesole maintaining its own diocese. In any case Fiesole as a city was annulled and, no more nor less than the suburbs of the contado, was obliged to acknowledge Florentine supremacy with the symbolic offering of candles at the Baptistery for the festivities of St. John the Baptist.The first mention of an officially constituted Commune dates to 1138. Two Florentine consuls, Brocardus and Selvorus, are mentioned as representatives of the city in a meeting of the Tuscan cities held at San Genesio (on the via pisana where it crossed with the via francigena) and where it was decided to constitute a League, for fear that Henry the Proud who had in precedence oppressed them as imperial legate might be elected emperor. From the middle of the 12th century on, information about the political makeup of the Commune became more specific. We are thus informed that it was under the guidance of twelve consuls, who took turns, two at a time, every two months. They were flanked by a council of boni homines, con sisting of 100-150 individuals, while at the base was the popular assembly or Parliament, which met four times a year in the cathedral of Santa Reparata. From what we can gather from the documents, the social structure of the city reveals a community constituted of religious and secular representatives, with three dominant social groups: the nobles, grouped into consorterie (the so-called "Società delle torri"), the merchants, and the horse soldiers, the backbone of the army, who included all those, noble or not, who were able to provide their own arms and on horseback serve the militia of the Commune. Among the nobles were to be found the old feudal families who had always lived in the city such as the Uberti and the Adimari, as well as the landed proprieters of the surrounding countryside or contado who were forced to live within the walls once they had been conquered by the Commune. Examples were the Buondelmonti and the Ubaldini. Although the nobles held most of the power in the 12th century, it was nevertheless mainly the merchants who were responsible for the growth of the city. The rise of the merchants accellerated in the second half of the century, as trade with distant countries was intensified and became a new and much richer source for the accumulation of capital. Extensive trade and its inseparable companion, credit, were what provided the Commune with its power of growth and were the basis for the economic and demographic expansion of the city. The requisites of commercial activity (the need for free circulation of the goods that arrived in or left from Florence) forced the Commune to protect the communication routes from the extravagant tolls imposed by the proprieters of the contado, as well as the authority of the neighboring municipalities. Throughout the 12th century therefore a goodly part of the military power of the Commune was earmarked for the struggle against the feudal regime (represented above all by the consorterie bound to the noble Guidi and Alberti families) and against rival Communes. This process of expansion underwent a temporary halt when Frederick Barbarossa advanced south into Italy. In 1185 the emperor even deprived the city of its contado and restored the marquisate of Tuscany, setting his younger son Philip at its head. But the provision had a brief life. In 1197, taking advantage of the death of Barbarossa's successor, Henry VI, Florence regained control of her contado, which she had probably never completely lost. At the end of the century and at the beginning of the 13th century, thanks to a series of fortunate military exploits, the Florentine Commune succeeded in getting most of the peoples of the contado to pledge allegiance "which formerly had been owed to the signoria of the counts of Guidi and those of Mangona and Capraia and Certaldo". (G. Villani, Cronica, V, 21). Henceforws, deprived of their authority and their power, were to be pushed back to the borders of the municipal territory and later fought and defeated even in what was left of their dominions. The rivalry with the neighboring municipalities also led to any number of disputes, mostly based on pretexts involving the establishment of boundaries of their respective spheres of competence. Particularly frequent was conflict with Siena, which was enlarging its contado in southern Tuscany at the expense of the bordering cities. With Pisa, which was the richest city in the western Mediterranean in the 12th century, things were different. Since Florence normally used the port of Pisa for its commerce with overseas countries, their relationship was one of collaboration and mutual aid. Clear evidence of the power Florence had acquired in the course of the 12th century is to be found in the expansion of its urban territory. All around the circle of Matilda's walls, in correspondence to the gates, populous suburbs had sprung up, initially elongated in form as they flanked the streets that ran out of the city. In 1172 the Commune therefore decided to enlarge the city walls and incorporate the newest districts. The perimeter of the new city walls, raised in barely two years (from 1173 to 1175), was twice that of the "old circle" and enclosed an area that was three times as great. The new walls touched on the Arno and were characterized by a rotation of about 45° with respect to the other city walls which had all been basically planned in relation to the Roman quadrilateral. As a result each side of the old belt (and the gates which generally were set at the center) corresponded to a corner of the new walls. Thus after more than a thousand years, the orientation of the city and its network of streets finally corresponded with the layout of the various routes enclosing the city which were based on the division into centuriae of the land surrounding the Roman colony. The course of the Mugnone was once more deviated for the construction of the new city walls. Brought further west, it flowed into the moats that ran along the walls, reminiscences of which are found in the names of what is now the Via dei Fossi (moats), as well as the church of San Jacopo tra i Fossi, in what is now the Via dei Benci. In place of the traditional four entrances, the new enclosure had six main gates and four posterns. As far as the suburbs across the Arno were concerned, which initially lacked an organic system of defence, it was not until later that they were fortified, even though a small part`of the "Oltrarno" was enclosed in the walls as early as 1173-1175. As a result the Arno became an infrastructure within the city, both as a communications route as well as a source of energy and a water supply for industries (mills and fulling mills). The bridge over the river, rebuilt in the early Middle Ages, "fell at the end of the fourth day of November" and was rebuilt at the present site of Ponte Vecchio, but with five arches and a road surface that was not nearly as wide as it is today. In the 12th century the urban fabric of the city must have been punctuated by numerous towers: in 1180 thirty-five were documented, but there were certainly many more. The existence of the towers, however, did not establish a "logical order coordinated by environmental and monumental qualifications" since basically their distribution was not bound to any special part, neither the "civitas vetus" (the Roman, Carolingian and Matildan city) nor the "civitas nova". Originally the purpose of the towers was that of offense and defense. They provided the owners with a place of refuge in case of danger and were therefore built alongside the houses with which they communicated through openings in the adjoining walls. 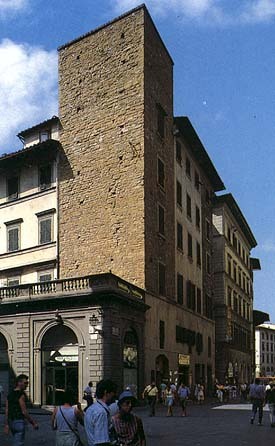 Only later were the towers used as houses (13th-14th centuries) when they underwent a series of transformations giving them the form we know from surviving examples: the Visdomini tower in the Via delle Oche, the Baldovinetti tower in the Borgo Santi Apostoli, the Torre della Castagna, in the Piazza San Martino del Vescovo. The tower-houses were not as high as they had previously been, and were provided with more openings and had large portals with pointed arch moldings at the base (previously the only entrance, as specified above, had been at a certain height). But in the 12th century the towers still served for military purposes and gave birth to the phenomenon of the "Tower Societies", associations which reunited the owners of various towers and through which an association (or consorteria) of several noble families succeeded in controlling a portion of the city. 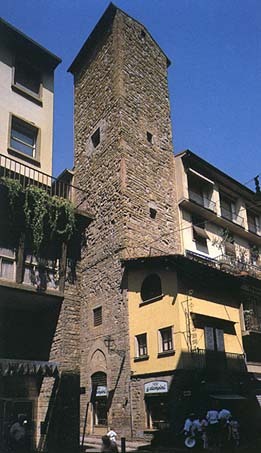 This union of various towers into the same association lies at the base of the city block, a typical structural unit of urban space in the 12th century. A considerable number of small and large churches also sprang up as the size of the city increased. In two centuries the number of churches in Florence was tripled, so that at the beginning of the 13th century the city had as many as 48 churches (12 priories and 36 parishes).